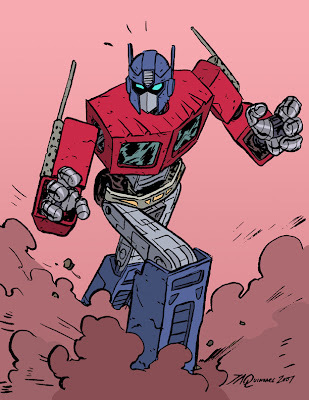 Joe Quinones' interweb-log: Con Sketch: OPTIMUS! Of course, the original wasn't in color. Great meeting the Amazing Joel Priddy and the Spectacular Dean Trippe as well. Thanks to everybody who bought prints and/or t-shirts. We'll see you again at SPX in October! ...Er... I'll hopefully see some of you again there. Let's not start talking about ourselves in the 1st person plural, shall we? Why didn't you tell me you were going to be selling prints of that picture you did that I'm in?! Don't you think that's the kind of thing I'd love to know? Chris I'm sorry. I failed you. I heard you ended up going to a different con..? How was it? Yeah, I went to "Stay-At-Home/Watch-Animaniacs Con '07"
I was glad to hear though that the Life Meter 2 anthology that I contributed to sold out. Did you see and/or get it? As to the print, I would absolutely love one. I just moved into a new place and I have this one hug empty wall that's just waiting for great art to be put on it. That should have said "huge empty wall", not "hug empty wall".. I don't even know what a "hug empty wall" would be. Oh, also, congrats on your team-up with Butterfly!